Aravintar collukir̲ār / Civacaṅkari. Cen̲n̲ai : Tirumakaḷ Patippakam, 1979. From the University of Chicago Library. அரவிந்தர் சொல்லுகிறார் Aravinthar Sollukirar by சிவசங்கரி Sivasankari. 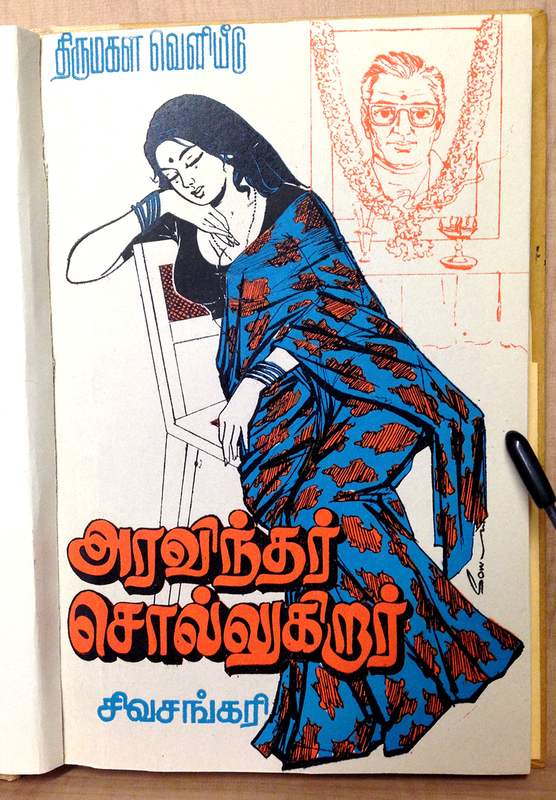 Sivasankari is a popular Tamil author, having written more than 150 short stories and 35 novels. If you are not distracted by this mourning woman’s blouse (yeesh! ), you’ll notice the three lovely different styles of lettering. The compressed publisher’s mark at the top, the amazing, delicious red shadowed title, and the large-countered author’s name at the bottom.